All transactions are safe and secure with a reliable history in online purchasing behind each of our associates. Buy the Red Lips Marilyn Face t-shirt to own Marilyn Monroe clothing and merchandise. This Marilyn Monroe t-shirt shows that she knew how to get stuff done. Seductive poses like this one were scandalous back in her day but they did get her noticed. Just as she said herself, "If I'd observed all the rules I'd never have got anywhere." 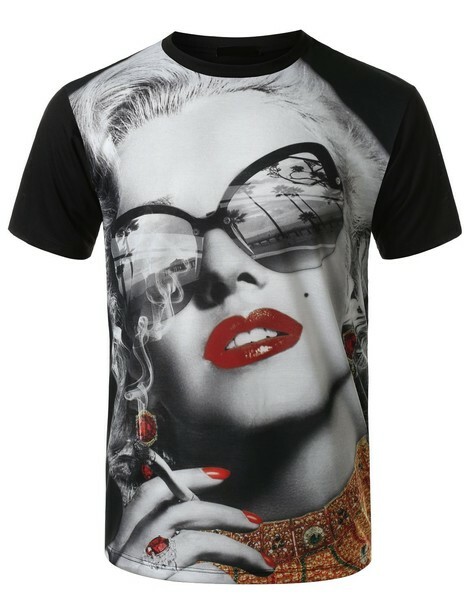 If you are looking to cause a stir yourself, then get this Marilyn Face t-shirt and the white dress Marilyn costume. Either will speed up any man's heart. Add a Marilyn wig for the full effect. Gentlemen prefer blondes...or so the movie goes. Browse Marilyn merchandise celebrating her most memorable roles. In addition to the Red Lips Marilyn Face tee above, browse the Marilyn Monroe Clothing Gallery for more apparel like men's and women's clothes, kids shirts or hoodies.